On the final day of the Tokyo Game Show this year, Sony held the "Indie Stream" event, celebrating all kinds of different upcoming indie titles. But of all the titles there, the one that caught my eye was Galak-Z: The Dimensional, a PS4/PC game that is one part Asteroids and one part 80s space opera anime. To start with, Galak-Z is a side-scrolling shooter where you control a small fighter, stranded away from your ship. But rather than being an automatically scrolling shooter like your typical bullet hell game, Galak-Z plays more like Star Trek D.A.C., or, at its most basic, the 1979 arcade classic Asteroids. As you play, you navigate at your own speed through asteroids, space debris, and scores of enemies just waiting to ambush you. But hands on, Galak-Z is a bit more complex than it appears on the surface. As you are in space, there is no air resistance to slow you down. Thus, you will drift all over the place, especially if you are always holding down the throttle. And as some enemies are dying to bum-rush you to get into melee range, flying backwards while avoiding obstacles becomes a vital tactic in combat. When playing Galak-Z, it quickly becomes obvious that it's also an homage to 80s space opera anime. Everything from the character designs to the large amounts of plot and dialogue serve to confirm this. And if all that weren't enough, there's always the fact that Macross missile-swarm is an important part of your weaponry. The demo only contained two levels of Galak-Z: the beginning of the story/tutorial and the first chapter of the story—which fittingly ended on a cliffhanger. And while it played smoothly and looked great, I noticed nothing that made me think that this was a game that had to be on the PS4 (or even a top tier PC). Still, I really enjoyed my time with Galak-Z and am looking forward to the full release. 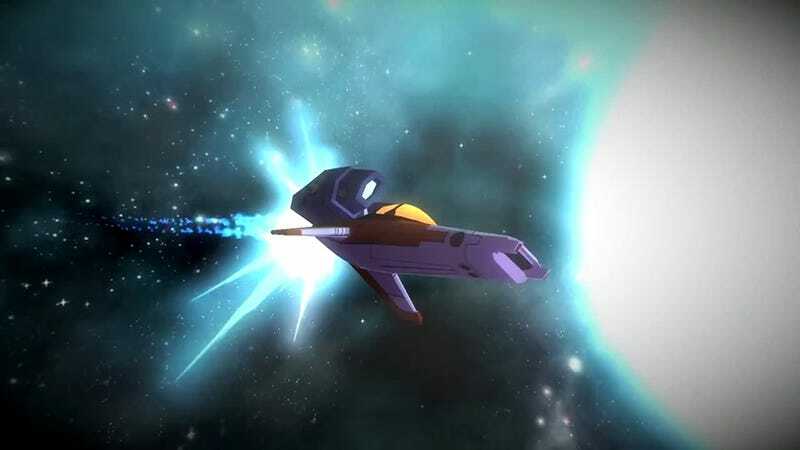 Galak-Z: The Dimensional will be released sometime in 2014 on PlayStation 4 and PC.